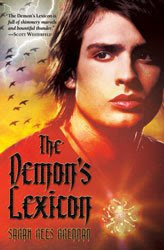 The Demon's Lexicon by Sarah Rees Brennan. Margaret McElderry books, an imprint of Simon & Schuster. 2009. Reviewed from ARC picked up at ALA. The Plot: Nick Ryves, 16, and his brother, Alan, 19, know only one thing: they have to keep one step ahead of the magicians. Why? Magicians get their power from demons; and the price they pay the demons? Human lives. Years ago, their mother, Olivia, had been a magician. She ran away and was saved by their father. Thing is, she took something from the magicians -- something valuable -- and they want it back. All the Ryves' brothers know is how to say one step ahead of the magicians. Sometimes it's close; 8 years ago, their father died when the family was almost trapped. That is all about to change. Siblings Jamie and Mae come to Alan and Nick, looking for help. Jamie's been marked for possession by a demon. The struggle between the human host's soul and the demon is so powerful, the host always dies. It's a death sentence. Mae refuses to believe her brother will die; and despite the danger, Alan agrees to help. Nick cannot understand why Alan is willing to put them all in danger - it means instead of being hunted by magicians, they'll be the ones hunting. Is saving these two strangers worth it? The Good: Hear the sound of shredding? That's me, shredding my few chapters of a book about a family with secrets hunting demons. Brennan does such a beautiful, wonderful job with this plot that I feel it's rather hopeless to go back to my draft. The Demon's Lexicon has gotten a lot of buzz in the blogosphere; and as soon as I heard "brothers" and "demons" I thought "Winchesters " (in this case, British Winchesters) and knew I had to find a copy. I'll be honest; I'm sometimes disappointed by horror books. The main characters have a tendency to be too Mary Sue-ish for my taste; the magic lacks an edge. Nick is sooooo not a Mary Sue (read Justine Larbalestier's take, but only if you don't mind the spoiler of a character description -- but not too spoilery!) Hunting hasn't made him weak and timid; quite the opposite. He has a collection of swords and knives and he's not afraid to use them. His mother is crazy - she favors Alan and barely looks at Nick. Is this magic edgey? Oh yeah. It matters; people go mad, die, are doomed. Alan and Nick are interesting brothers; there is something about Nick that reminded me of Dean Winchester, the son who unquestioning follows in his father's footsteps. The Ryves family may run - but they also know how to fight back. When Nick kills a magician, he knows he is killing a human; but he doesn't care. Alan, older, with a bad leg, glasses, appears to be the bookworm - but that would be underestimating him. Their father left Alan, 11, as the man of the house. Alan has taken that charge very seriously. And by the end -- let me repeat. Don't underestimate Alan. Brennan's characterizations of these two are very well drawn; we see things from Nick's perspective, from how he thinks and feels, and if it takes us a while to realize that Alan is the only person he cares about, it's understandable. Instead of first person, though, it's third person and this little bit of added distance actually helps create a fuller picture of Nick than a first person narrative ever could. Everything seems so understandable...until, suddenly, it doesn't. Masked in a horror story, Nick comes of age, questioning -- who is he? Why is he living this life? The ending was so satisfying and the plotting so well done (and I sowanttosaysomethingaboutthetwistsandturnsbutthatwouldgiveitaway) that I got to the end and immediately reread the first few chapters. Would Brennan's writing and style hold up, once I knew where it ended? It did; if anything, it was better the second time around. I had no idea that this was part of a trilogy; I read it believing it to be a standalone. I'm quite pleased to find out there will be more books in this world. Is it a favorite book of 2009? Hell, yes. A great review for a wonderful book -- and I know exactly what you mean about the "I sowanttosaysomethingaboutthetwistsandturnsbutthatwouldgiveitaway" part! I was reading the last couple of chapters in the kitchen while making dinner and when I got to the big twist I screamed right out loud! Very well put. So fabulous! I picked this up after reading some positive reviews and ended up putting it down because I couldn't get into it. I think I'll pick it back up again - your review was so good! Thanks! *beams at you* It made my day to get such a fabulous review here - I love this blog! RJ & Gwenda, I'm afraid to make too much of the twist because I'm the type of person who, once I hear that, begins to make outlandish geusses etc. But this is very well played! Patti, Nick's voice & his strength of character grabbed me at the start and I liked the Buffyesque humor of Mae & Jamie, but plot wise it took a few chapters. Definately give it another go. Sarah, I'm glad you like the blog and the review. And I cannot wait to see where you go with the next book! I know about the temptation to shred your work, prostrate yourself and shout "I'm not worthy!" but DON'T DO IT!! I wanted to batter my heroine around the head with her bow after reading the Hunger Games, but the feeling eventually passed. Great review. I'm waiting for the library to respond to my request and buy this book. Just got it from the library a few days ago!!! Can't wait to read! Eep! OK, OK, you had me at Winchesters! Another one for my must read list!